In this musical, which manages to look back with nostalgia upon prohibition and the depression (no small accomplishment), George Raft plays George, a hoofer looking back on his glory days. His memories are triggered when The Paradise Club, a nightspot where he used to work, is about to be turned into a bowling alley. In the Roaring '20s, George and his partner Billie (Janet Blair) were a star attraction at The Paradise, run by Nick (S.Z. Sakall). 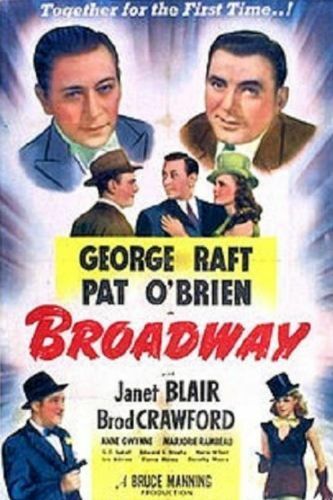 George wants his relationship with Billie to be as graceful off-stage as on, but he has several rivals vying for her affections, including gangster Steve (Broderick Crawford) and policeman Dan (Pat O'Brien). Marjorie Rambeau plays Lil, modeled after brassy nightclub owner Texas Guinan. Raft actually worked for Guinan in his early days as a dancer, and he gets a chance to show off his fancy footwork accompanied by a number of classic tunes, including "Alabamy Bound", "Yes Sir, That's My Baby", "Sweet Georgia Brown", and "I'm Just Wild About Harry". Broadway was a loose remake of the 1929 Merna Kennedy vehicle of the same name.